In this episode, we will learn about how to create programs and special events that attract new visitors from Starlyn D’Angelo, Kevin Walsh, and Katherine Jennings. Great. Starlyn, thank you very much for taking some time out at the Museum Association of New York Conference to speak with us today and to share some of your insight with our listeners. Thank you for including me. I’m really excited about it. I’d like to dive into our first question, which is: How do you attract new audiences within your region? We’ve been using social media quite a bit to reach younger audiences, and we’ve also been adding a lot of new types of programs focused on the Maker Movement. The Shakers were experts at producing literally thousands of different products and handcrafting things. So, we offer a lot of handicraft types of workshops, and we’ve also been adding programs like History Happy Hour events, and bringing in music to the sites and really just looking at the demographics in the community around us, and trying to figure out what is the greatest need in our area. So, we happen to have a large population of active seniors, so we do programming geared specifically towards that population. That’s great. I like that you started with, how you reach new audiences through social media but then went on to talk about taking advantage of some of those things that are hip and not necessarily new but, sorta hip right now. Like this whole idea of the Makers Movement, and incorporating that into your programming. And then also, I think this has been a theme with our conversations, is understanding the demographics in those, in the community and what they’re looking for. Yeah, it just makes sense. There’s tons of demographic information out there. So, when you’re doing programming, I think the first step is really to look at who’s in your neighborhood, and then think about what they might be interested in, engaging with. Yeah. I think that’s great. How are you reaching past your regional market to get visitors to your location? Yeah, we definitely pay attention to that as well. The historic site is a natural gateway to the capital region. We’re located directly across the street from Albany International Airport, and actually, the airport was built on former Shaker lands. So, we have a great relationship with the airport, and we have an exhibition up in the terminal all the time, so we get a lot of out-of-town visitors because of that. So, it’s really all about partnerships, partnering with the airport, partnering with Discover Albany, which is our Visitor’s Bureau in the region, and then we also reach out to other museums. There are three Shaker museums in the capital region, and just a couple years ago, we joined together and did a major exhibition at the New York State Museum with the intent to drive traffic to all three of the Shaker museums. That I think that is very effective for us. We did see an increase in visitation through that partnership, but we also partner with other types of entities. It’s not just museums, we also work with several chapters of Rotary, and they offer a pet expo on our grounds every year. It’s their event, they run it, which honestly was a little bit frightening initially the first time we did it, because of that loss of control over it. But we made sure that it was going to be well run and safety codes would be considered and that sort of thing, but beyond that, it was their event. It’s drawing in lots of people who would otherwise never come to the site. And there’s nothing better than making connections between people than having people with their pets because they like to talk to each other. Initially, Shakers did not allow pets in the community, but later on, they did. So, it gives us a chance to talk about changes historically to the way that Shakers lived, but it brings in all kinds of different people. We have photo booths for animals, people taking photos with their pets, that sort of thing. It’s really wonderful. Our staff doesn’t really have to do much work at all to bring those people to the site. Partnerships are the way to go, especially for smaller organizations like ours. Yeah, and I’m really thankful that you brought that up because partnerships are actually something that we talk a lot about on this podcast and, I think it is really important to the work that we do, especially in the work that you do, in the travel and tourism industry. I love the whole idea of the pets. I think that does bring in a whole new kind of audience and connection with people. I think that that’s just brilliant. We certainly also pay a lot of attention to what’s going on with tourism, we work closely with Discover Albany, and they support us. They’ve given us funding to redo our website, they help with marketing, and so it’s really important that we are communicating with them. We’re also working with a number of other museums in Albany through a collaboration called “The Partner for Albany’s Stories.” It’s really a confederation of eleven cultural entities that are focused on Albany and Albany’s story. And so, we do whatever we can to cross-promote, we share volunteers, we do everything that we can to support each other. The idea is that we both rise together, so that if we help support our partners and they succeed, then we will be more likely to succeed as well. And Albany is more likely to become a destination for tourists if we’re all working in concert together. Yeah, I think that’s a really great point as well because tourists aren’t going to just come for one experience, one museum; they are looking for that, that whole story, and I think that that’s really great that you have that collaboration. So, you’ve talked about it a little bit in answering the first two questions, but the other thing we are trying to explore at this conference is the whole idea of being a community anchor. How has your museum worked to be a community anchor? As I mentioned before, we really are a natural gateway to the region. So, I think that’s really important. Our historic site actually is owned by Albany County, we do a lot of work with the county, and also the airport to really help the county legislature and the county Executive and their staff understand the potential of the site. There is no other place in the country where you can get off a plane, walk five minutes across the street and take a hike around nature trails, participate in a craft activity or see a concert. It’s really a special kind of situation at Albany Airport. We think that that’s really significant for the whole region. 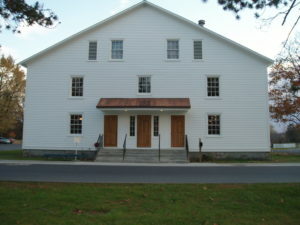 There are two other Shaker museums nearby; we don’t really need to duplicate what they’re doing. Hancock Shaker Village is really great at serving tourists. They get a large number of visitors from around the world. The Shaker Museum in Mount Lebanon has the premier collection of Shaker artifacts, and they’re really wonderful in promoting Shaker Scholarship. If we serve as the gateway, then we think we could draw more tourism to the region so people could come to our site. It’s easily accessible, right next to the airport and major highways, and then, ideally, they could take a shuttle or get some kind of easy transportation to downtown Albany to see cultural attractions there, or out to the Berkshires, or up North. We would really love to be a resource for people who are learning about the region for the first time and really promote the other attractions. Also, agritourism, and that sort of thing as well. We have rack cards, we have a pretty robust rack card thing. The idea is that we are trying to let people know, not just about the history of our site, but also about all the resources in the region. Yeah, I think that’s a really great vision. I also appreciate how you describe the other Shaker museums in the area, and how you all complement each other. We really do. It seems like a narrow area of American History, but it’s actually really complex, and you can talk about a wide variety of different topics. The three museums working together, I think that we’re much better able to meet the needs of both our local residents and tourist who come to the region. We get a lot of business travelers. It’s the capital region. We’re introducing all kinds of people from all around the world to New York State and the capital region. I really think that that’s a really important part of our function at Shaker Heritage Society. Yeah, that’s really awesome. Looking into the future, what are your goals, your organization’s goals for the next three to five years? We got a million dollar regional economic development grant that we wrote on behalf of Albany County, and so we’re working with the county to implement that. When that’s finished, we will have largely stabilized the nine buildings in the Church Family property, which is the publicly accessible part of the Historic District. The vision is really to get those buildings utilized. They are currently, mostly abandoned, except for a couple of the ones that Shaker Heritage Society uses. And our vision is a mixed-use facility. We also will soon have permanent housing for homeless veterans on the property. That’s something we’re really excited about because it will bring back a density of residential use of the property, which was historically how it was used. We have all kinds of exciting ideas about how we can work with the vets to have a mutually beneficial relationship. Workforce development programs where we can train them in traditional building trades, or we can trade them to be interpreters, so that they can acquire skills to help enhance their quality of life, and also benefit the society and tourists, as well, and local residents. We actually have a lot going on, but my vision for the future is that the “Soldier On” project with the veterans housing will be completed within five years, and the buildings that are abandoned will be stabilized, and we will have identified people who can occupy those buildings. Some of the buildings are potentially office buildings for single or multi-tenant offices. We’d like to have a restaurant in one of the buildings. Really, the goal is just to get the place utilized and benefiting the community. Yeah. That’s fantastic! Well, it sounds like you have a lot to do in the future, and I really appreciate you taking some time out today and sharing your insights with us, and with our listeners. Thank you very much. What a great conversation with Starlyn, I love the creativity in connecting the Shakers to the modern Makers movement and the new handicraft workshops that they offer. Let’s listen to Kevin to hear how the Central New York Living Center appeals to so many diverse interests. Perfect. Kevin, thank you so much for taking some time out at the Museum Association of New York’s annual conference to speak with us today. And I’m really looking forward to hearing your perspective on some of these questions, so we’ll dive right in. And the first question is: How do you attract new audiences within your area? Our museum has only been in existence for about five years. So what we’re doing is we are trying to hold an event a month, and our basic audience is actually quite diverse to start with. Our museum has a veteran’s component, a military component, a railroad component, a local history component. Brockway Trucks were manufactured in Cortland, New York, until 1978, so we have a large Brockway Truck component; and we have an agricultural history component. So we start out with a wide basis of folks who might have an interest. What we’re trying to do to reach out for new things is we’re trying to do temporary exhibits that might attract a somewhat different group of folks. We’re looking at different areas where we can try and expand our reach. But to be honest with you, the first thing we have to do is make people aware that we’re in the Cortland area because there’s a lot of folks in the Cortland area who are not sure of who we are and what we do and part of that’s, believe it or not, signage. The town of Cortlandville is not terribly sign-friendly, and we didn’t have enough money to really erect a sign that, kind of, met our needs. But now we have, and it’s amazing; small, local regulations have had an impact on our ability to even tell people where we are. Sure, yeah, I can see how that can be a challenge. What I like though, about what you just described, is how diverse your programming is. And so you do have the opportunity to reach a whole diverse audience. And I’d imagine out of all those things you talked about, that there’s some very distinct kind of audiences or followings; like with the Brockway Trucks, for example. Yeah, Brockway Trucks is very much a specialty niche. And that’s how the whole thing started. In 2000, the year 2000, merchants in downtown Cortland were looking for something to help bring people to downtown Cortland, and there were a certain number of collectors of Brockway Trucks and they started a Brockway Truck weekend. That grew and grew and grew, and suddenly there was an organization for a Brockway Truck museum and there was also a local museum called the Ken Eaton Collection that was looking for a home. Ken Eaton collected a significant amount of military stuff, train stuff, and local memorabilia. Then there was also an outfit called Tractors of Yesteryear that was looking for a home; and all these things came together, purchased an old, well, it’s not old, but purchased a vacant department store. Cortland is blessed with many people who know how to build things. And we have a world class structure and facility with some very interesting museums inside the facility. That’s really great. And also, for our listeners’ sake, the location of your facility is in a really interesting spot. Yes, we’re less than a mile from Route 81. Cortland and Homer are located almost exactly halfway between Syracuse and Binghamton. We’re in virtually the geographic center of New York State, and between two somewhat good-sized metropolitan areas. That’s awesome. It’s kind of a perfect segue, to this next question which is talking about reaching visitors beyond your local market. It’s been quite an interesting adventure. What we have found, as we’ve looked at who comes to our museum, and what attracts people is, I think there’s only about 20 percent of any population that are actually history people. If you’re not in a large populated area, that can be a problem. So you have to reach out to other metropolitan areas. Another thing that we found, kind of a secondary thing, is that people from Binghamton, which is about 40 miles away, appear to be very willing to drive 40 miles north to visit something like us. Syracuse people, not so much. Syracuse, for some reason, I think maybe because their metropolitan area has more things to do, we have a more difficult time attracting people from the Syracuse area to drive south to us. And that’s been a challenge for us, and we have very limited advertising funds. We depend upon the county’s bed tax from the hotels and, unfortunately, our advertising budget this year was cut by 50 percent. So we’re going to look in the Binghamton area for the most part, because that is where we seem to have the most success in attracting folks. So that’s what we’ve been doing. We’ve been reaching out a little bit in the capital area, reaching out a little bit in the Rochester area; but I think the southern tier seems to be our best bet in attracting out of the local area audiences. And I think part of what you’re sharing with us is really kind of knowing what peoples’ travel patterns are and not trying to force something on an audience that might not just travel in that way. I would love to do that, but we don’t have enough money! So we have to spend our money where it makes a certain amount of sense for us. But we’ve also had discussions with the county tourism folks and telling them that they need to work on changing the attitudes of people who live in another part and they have deeper pockets. They have to figure out how to change the attitudes of people who live in the Syracuse area to be willing to drive the 40 miles south. Yeah, interesting. Well, I think that’s another good perspective because what you’re talking about is kind of creating a partnership with folks who can send that message out, right? Instead of relying just on your own organization. Yeah, and it’s been kind of a challenge just to get that information. A lot of people, at least in our organization, didn’t really think too much about how much or how important it was to quiz the customers, you know? They kind of just thought if you build it, they will come. And they built a beautiful thing, but there’s more to it, and we’re working at learning more about who comes to our museum and where they come from and what is the best way to attract people from outside the area because that’s the only way a museum can survive, is to continue to attract people from outside the near local area. At least in our world, because Cortland’s only got 20,000 people. Right. Well, that’s also a good segue, and we’ve kind of already talked about this a little bit, but basically in how your museum can work as a community anchor. Because we have such a wide range of basic mission areas, we just last week had a Vietnam veterans day, and we invited all the local Vietnam veterans to come to our museum; we brought in the VA hospital, there’s a place in Chittenango called Clear Path for Veterans that we brought in and, essentially, we invited the local veterans’ community to come and celebrate Vietnam veterans. We have also, trains. Interestingly enough, there is a certain number of folks out there who’re interested in trains; so we have a Train Day every year. Brockway Trucks, we devote an entire weekend in August to Brockway Trucks; and literally, we get thousands of people; they come from all over the country for Brockway Trucks. We have a tractor pull in September that brings in folks bringing their tractors in and competing against each other. So we do, and we’re always looking for other interesting things between our facilities in our mission areas, we’re doing quite a bit of diverse events to bring in people who are interested in history. Yeah, that’s great, and I think changing the programming like that and really kind of speaking to the different audiences seems like a really good model. So that’s fantastic. So now looking into the future, what are your goals for the organization in the next three to five years? We have several levels of goals. Our basic goal is to keep the lights on. That is always our first part of our mission, is to make sure we’re still there. We have a season; and our season starts sometime around the end of April, beginning of May, and runs through the end of August. So the trick is to make sure you have enough money to get through the times when you don’t. So what we try and do is, again, do the events; we’re doing some other interesting things. I had never heard of a Trunk Sale before three weeks ago, and we have people coming in, it’s sort of a rummage sale out of the back of your trunk, you know? But what I’m getting at there is we’re opening up past some of our mission things and reaching out into some using our facilities to make some money for us. And having sort of sales and things like that, to craft sales and that kind of thing, just to keep the money flowing. We’re looking at maybe changing a little bit of what we do there. We’re talking about having some local artists come in. We have a 100-person auditorium in our facility, and we also have a large cafeteria, which could be used for, say, an art show. We’re looking at maybe looking for some local artisans to come in and attract people that way. And that’s a little out of our normal gig, but we think that, again, just bringing in diverse people who might not be interested in looking at a Brockway Truck, but might be interested in looking at some local artists’ work. Three to five years from now, I would like to say that we would not be as worried about our off-season. I know it sounds kind of crass, but keeping the doors open is our real, main goal. Sure. Well, I am sure some of your colleagues can completely relate to that. So I would say that that’s an admirable goal; but also, I do think that’s kind of core to what you’re doing. You’re mission-driven, right? You’re not a for-profit business and trying to figure out how to balance all that, still keep the lights on. Yeah. And I’m sure that’s what keeps you going every day. That’s terrific. Well, Kevin, this is a really great conversation and I really appreciate you sharing with us. And thank you for taking some time today. Kevin’s insights were very interesting, they have such a great opportunity to tie in with several affinity groups like his example of the Vietnam Veterans Day that they recently hosted. Next, Katherine shares the creative things that they are doing at the Edward Hopper House Museum & Study Center. Katherine, thank you so much for joining me today and taking some time out of your conference schedule to talk to me at the Museum Association of New York Annual Conference. I’d like to start with our very first question, which is: How do you attract new audiences within your region? We’re in the middle of a marketing campaign right now. We were just newly rebranded, and we have the benefit of a very prestigious design company named Carbone Smolan, helping us with our services. They’ve given us a consistent logo to use, and we’re updating our website right now as well as doing a brochure. That’s great, and I’m sure all of those things are helping you connect with not only folks who have been supportive of your organization but also perhaps new. Yes. Exactly. 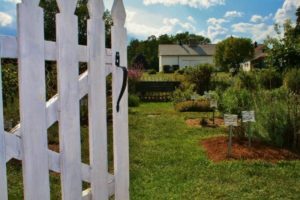 One of the initiatives we’re doing is a garden in the back of the original home, Edward Hopper Home, and we’re using that to attract new audiences. 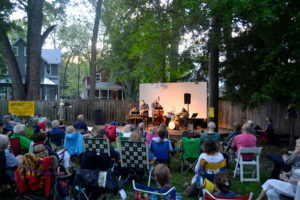 We currently have a jazz series in the backyard, and that’s been going on for years. And we hope to attract new people to come in and do events there. We’re hoping people will do weddings there, as well. Oh, yeah, and I’m sure that’s really popular, especially these days, right? Weddings. People are always looking for new and unique places. Somewhere my friend didn’t get married would be nice probably. Exactly. We’re trying to attract a new audience, the Millennials. That’s great. How do you expand your reach, broaden it to reach visitors beyond your community or your region? One big method to use is the Internet. So, we’re using Carbone Smolan to help us redo our website. We also have someone helping us use social media. So, we have Facebook and Instagram posts, and we currently have a major exhibit going on at the museum. Sean Scully, who is an artist of great renown, who lives in the area, and he decided to lend us eight works to show at our museum. And that’ll be on ‘til the end of this month. It’s interesting. So that’s drawn a whole new audience, and we’re using different mechanisms to get that out there. But it’s drawn a lot of people from Manhattan. That’s fabulous, and I can imagine different exhibits will draw different types of audiences. And then once they come, kind of making that connection with them to know who you are, so they’ll return, is that correct? Yes, exactly. Everyone signs in, and we get an idea of who we’re attracting then we try to build on that. Yeah. Well, that’s great. That’s really awesome. Just thinking about your museum and the community that you’re in, how does your museum serve as a community anchor? Well, we currently have the jazz series. So, that draws a lot of people, and we use a lot of services within the community. When you think about an event, you have to have catering, you have the public transportation people coming, and it’s really beneficial for the community to have us there. And we are in our process of rebranding. We’re redoing the signs around the town. And there are local signs that refer to the Hopper House, so it really is an integral part of the community. Yeah. That’s great. In launching your new brand, you’re also thinking about how that’s represented throughout the community as well? Yes, and we’re actually in the middle of an expansion. We’re hoping to make the house ADA compliant. So we’re hoping to build a visitor’s center and expand the house. We’ve received several proposals on this from different architects about how to do so. That will really change the facade of the house, will respect the integrity of the original home but will expand for the backyard and make it a new venue that is very welcoming in the gardens. That’s great. I can see how important probably this rebranding is and establishing these new audiences are going to be, kind of the future of the home as you go down this path of the new visitor’s center. And it’s a perfect segue into our next question, which is really, what are those goals that you have for the organization in the next three to five years? 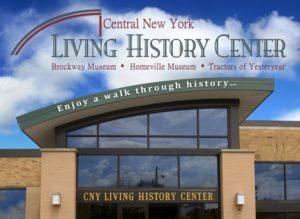 Okay, so we were just recently recognized by the New York State Board of Regions as a museum, so we were rechartered. As part of that, we are now, we also received a long-term loan of approximately 1000 pieces of memorabilia from Edward Hopper’s early life. We are curating that material now and showing that. There’s one room on the first floor that’s dedicated to that exhibit, and then we will have the study center on the second floor. Then in the original home, in the living room and the dining room, we have art exhibits that change every six weeks. So we’re bringing not only current artists in, but we also have this exhibit of his early life. So that’s what we’re trying to promote, his early life and a study center for scholars to have access to that material. That’s great. Well, I’m sure there is no shortage of things to do as you work towards those goals and towards that vision. Are there any final thoughts that you wanted to share with us? I was going to say another thing that we have is a brochure that we’re trying to get out there and that’s part of our marketing campaign and that will be placed all over. We’re trying to draw people from Westchester County, Bergen County, Orange County, Rockland, where the house is. Also, we placed an ad in the New York Times, so it’s with the Scully exhibit, I think that’s opening the door right now for a whole new rebirth of the home. That’s really awesome. Well, thank you very much, Katherine, for taking some time out to talk to us. Thank you. It was nice meeting you.